If you haven’t visited Mexico outside of the tourist traps, you’re missing out. I recently wrote a piece about a small portion of my trip. I felt like we did so much, but I barely scratched the surface on my two-week visit last summer. There is a certain magic to Mexico, you feel it when you’re meeting local people, staying in their homes, meeting their families. The importance of family, friendships, celebrations is very apparent. Few countries do hospitality like they do in Latin America, and Mexico is no exception. It’s possible you may not4 have heard about the Pueblos Mágicos de México, which is, essentially, the Magic Towns of Mexico. They are a group of towns that provide “magical” experiences to visitors. The towns each have something unique that they offer tourists, whether it be cultural, historical, or a wealth of natural beauty. If you haven’t already, next time you visit, you absolutely need to make a point of visiting one or more. My trip took me to four Pueblos Mágicos, all of which did not disappoint. Sayulita, which I mentioned in my previous blog, Viva Mexico. Sayulita is really close to Puerto Vallarta, so if you are planning an all-inclusive trip, it’s certainly worth getting off of the resort and checking out this beautiful town. Sayulita has such a special place in my heart, and is a perfect place to plan a little romantic getaway! 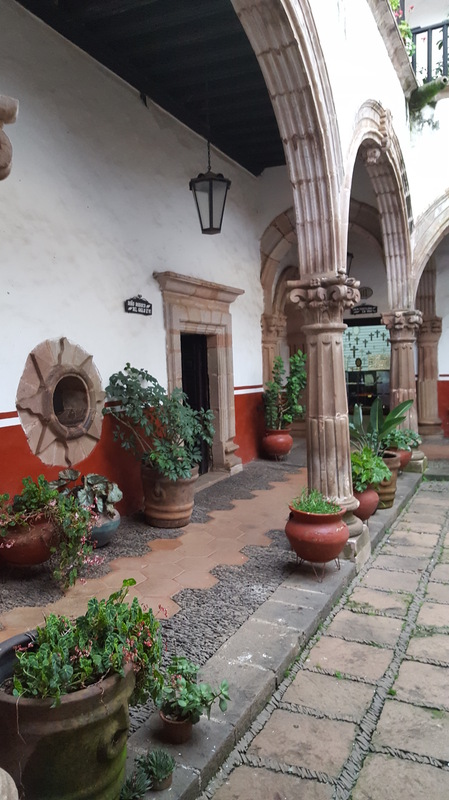 I also had the chance to visit Pátzcuaro, which was part of the Tarascan Empire and existed before the Spanish conquistadors landed. It was founded in the 1320s, and after the Spanish rolled in, Vasco de Quiroga made it the original capital of Michoacán. 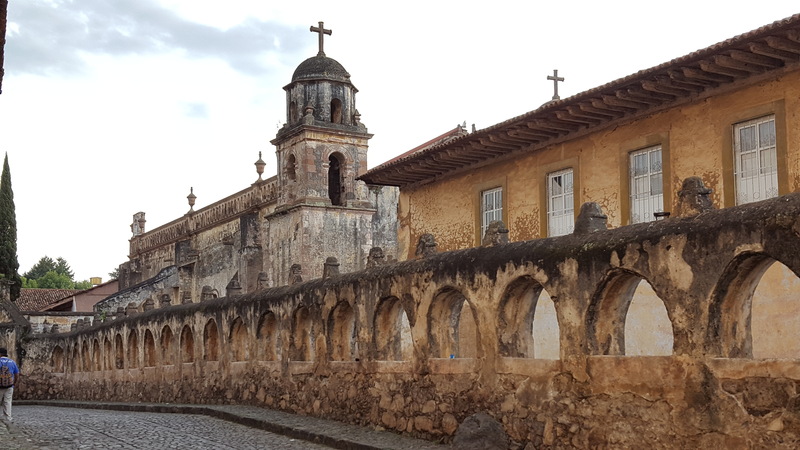 Visually, Pátzcuaro is stunning. The white and red buildings are a beautiful contrast to the surrounding lush green mountains. The town screams of history and offers some of the most amazing handicrafts from the Purépecha artisans. You can pick up amazing textiles, jewellery, sculptures, pottery, and small gifts to take home. 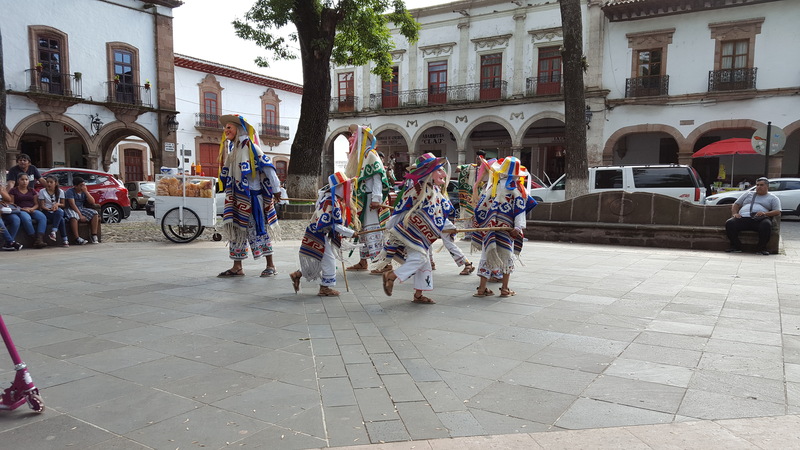 In the town square of Pátzcuaro, you can often catch great performances, one of the best celebrations for Dia de Muertos, and an incredible nativity scene (or Nacimiento) at Christmas time. I’ll make sure to post pictures of that this Christmas! So, after Vasco de Quiroga died, the state of Michoacán moved the capital to Morelia, which was then called Valladolid and is one of the first cities of “New Spain”. Morelia is an incredibly special place and is well deserving of its status as a Pueblo Magico. The city centre is a UNESCO World Heritage site with surrounding 16th & 17th century stone buildings. 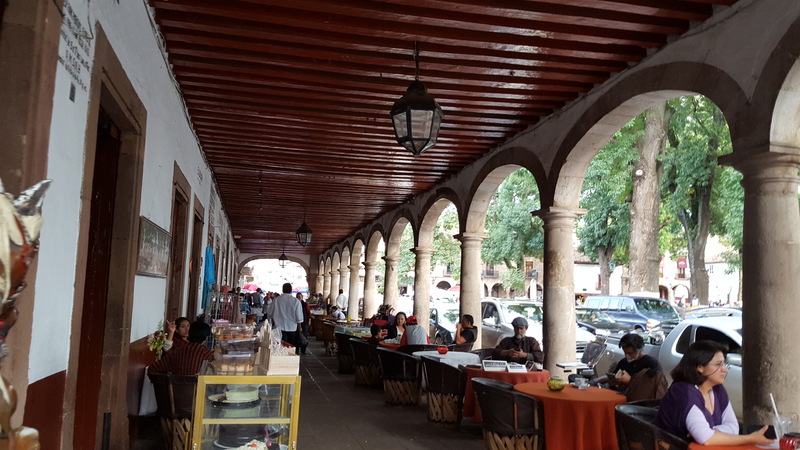 As you walk through the centre, you’ll pass through large archways, Spanish-styled buildings which now house museums, hotels, cafes, restaurants and more. You’ll discover hidden plazas, squares, shops and mercados throughout, which presents numerous opportunities to bring home a few souvenirs. One of the most impressive views was that of the pink stone cathedral while eating delicious tamales at Lu Cocina Michoacana. The Catedral de Morelia took 84 years to build and is constructed from local pink stone. Inside you’ll find the “monumental organ” which was imported from Germany in 1905 and consists of 4600 pipes (or flutes). If you have the chance to enter, I highly recommend it. You won’t be disappointed. 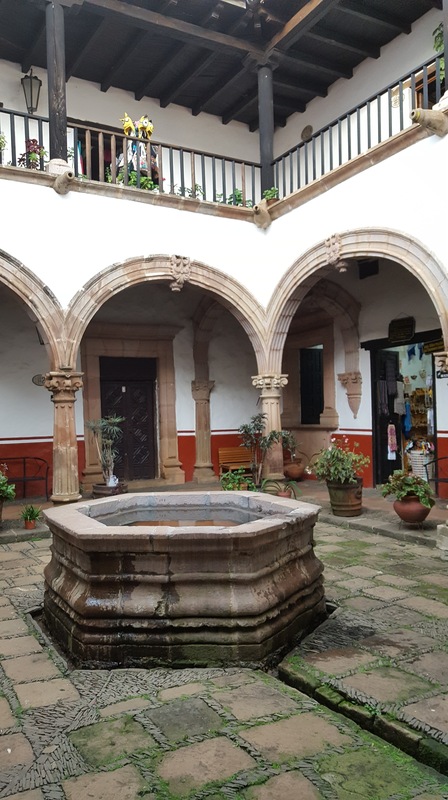 Another amazing place to walk around is the Colegio de San Nicolas, close to the square. Now referred to Universidad Michoacana de San Nicolás de Hidalgo, the university is still in operation and is the oldest university in the Americas! It went by a different name and has ties to our friend Vasco mentioned above, but was restructured and renamed after the Mexican Resolution. The structure is absolutely gorgeous with its archways, incredible gardens, and courtyard. You’ll find beautifully painted murals depicting historical events of the area, and about a million angles to take photos from. The third Pueblo Mágico I’ll talk about in this blog is Mazamitla. Located south of Guadalajara in the mountains, the town claimed its status as a Pueblo Magico due to its natural beauty. Founded by the Aztecs in 1165, the town is now a popular weekend destination for travelers from GDL. 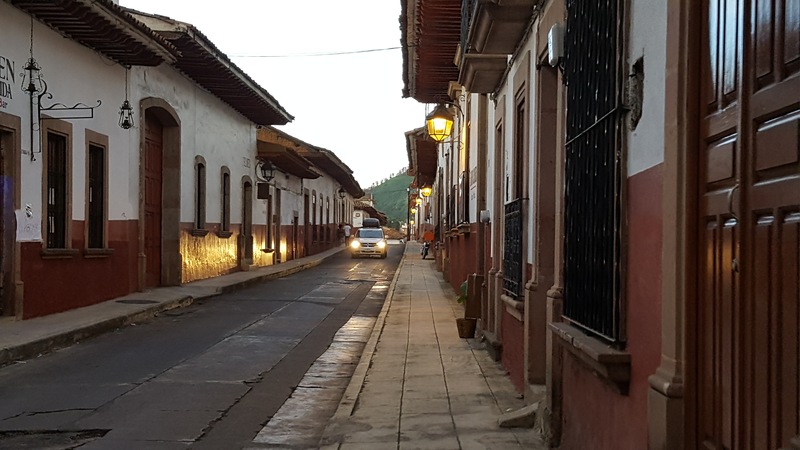 You’ll discover similar building styles to that of Patzcuaro, but it has its own unique spin. You can wander the streets and find new things every few steps, find your way to the square surrounded by music and dance, and then wind up in the mercado sipping fresh guava juice (that doesn’t cost $15, Vancouver!) and snacking on a hand-made tamale. Heaven. One of the most eye-catching cathedrals is the Parroquia de San Cristobal. The striking white of the church contrasts with the backdrop of mountains and bright blue sky. Grab a snack from one of the many shops and sit outside marveling at the towering cathedral. It’s absolutely stunning. I was lucky enough to stay close to Mazatmitla in a very small town with my boyfriend’s family. The view from the house was so breathtaking. One of the most shocking things for me was how familiar the trees and other plant life felt. The climate was very much like a spring or summer day in Vancouver, with cool nights and warm days. I definitely look forward to spending more time there this winter! One of the many great things you’ll discover about Pueblos Mágicos is the lack of commercial signage and advertising. There seems to be more magic to a place if you aren’t seeing huge McDonald’s signs among the historic, whitewashed buildings. The more I learn about each place, the more I can’t wait to see. Personally, I feel like those that only visit Mexico and stay in all-inclusive resorts are doing a huge disservice to themselves. There’s so much to discover, so much to learn and so much you learn about yourself when you immerse yourself in a country. Personally, I feel like those that only visit Mexico (or any country for that matter) and stay in all-inclusive resorts are doing a huge disservice to themselves. There’s so much to discover, so much to learn and so much you learn about yourself when you immerse yourself in a country. You’ll fall in love with the food, the people, their traditions, or at least you’ll come home knowing a lot more and can share with your friends! I really want to visit Mexico and explore it properly – reading posts like yours makes me realise just how much there is in Mexico beyond the famous resorts! Love your photos! Thank you! It’s such a unique country, full of amazing food, kind people, and diverse cultures!